Again! 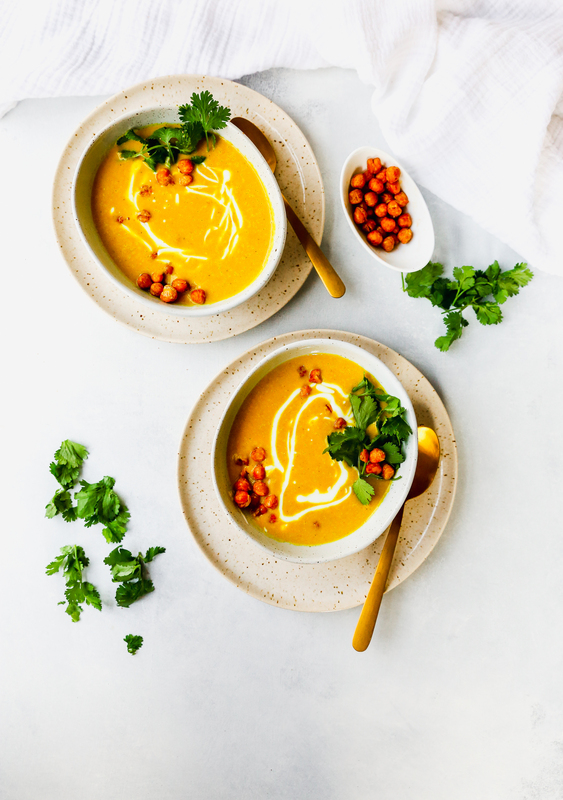 If you’ve been following this blog for any reasonable amount of time, you already know that I am complete soup fangirl. It’s one of my favorite ways to eat a meal, and I eat it all the time. Even in the summer. As a result, I’m constantly trying to come up with new and interesting recipes for soup. This one happens to meet all my requirements. It’s filling with a mix of healthy fats, fiber, and protein. It’s really good for you. And finally: I could eat it again and again and again. Which is exactly what happened to this batch of soup. Dan isn’t the biggest fan of soup. Not that he doesn’t like it, but he doesn’t feel like it counts as a full meal. I know a lot of people agree with him, so if you’re in his camp, I urge you to try this out with a side salad or a sandwich on the side! Or maybe as an appetizer/first course! Because he doesn’t get nearly as excited as I do about soup, I ended up eating most of this one on my own. NOT complaining, though! I loved every drop of this magic golden elixir. Oh, and the crispy chickpeas on top? To die for! They add such a necessary crunchy component here. This meal is accidentally vegan and gluten free. The full disclosure is that I don’t purposely cook vegan or gluten-free food on a regular basis. We do go meatless several nights a week, but that’s more by chance than anything. I like to mix things up and sometimes meat just isn’t needed! Dairy, on the other hand, is almost always included in some form (usually cheese!). So this vegan soup is a departure, for sure. That said, it isn’t lacking in flavor, heft, or nutrition. It totally stands up on its own! And it still totally counts as a full meal to me. The soup itself is loaded with warming spices like turmeric and cumin, cauliflower, and coconut milk. It’s creamy and thick and doesn’t taste like a cream-less soup at all! The cauliflower does something magic here. 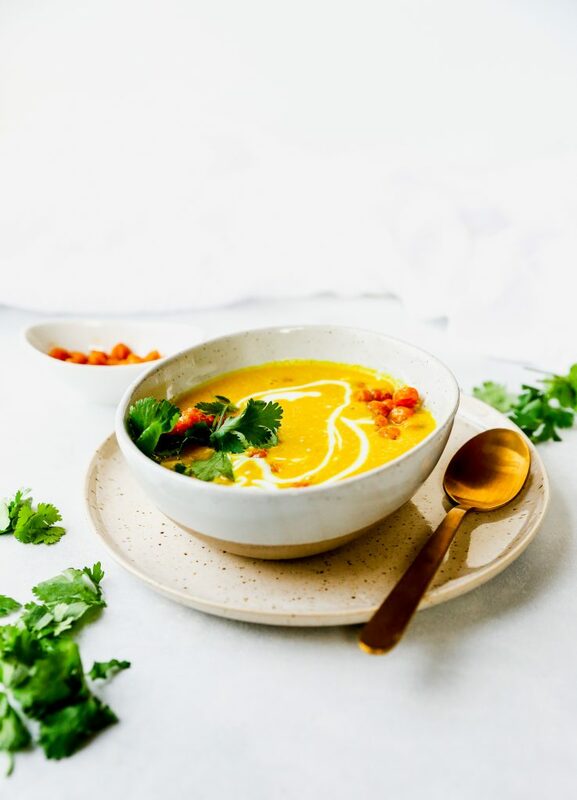 It not only gives the soup that velvety texture once blended, but it also adds substance and health without leaving any cauliflower taste behind. Seriously. If you served this to a cauliflower hater, they would never know there was cauliflower in there! Promise. 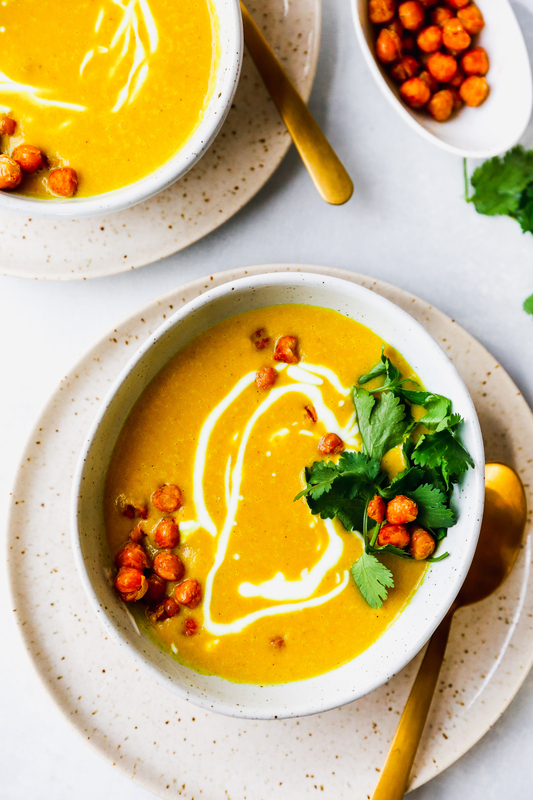 This soup is kind of like a super savory, dinnertime take on golden milk, which has been taking the internet/social media scene by storm for awhile now. If you don’t know what it is, just do a quick google. It’s a superfood concoction made with turmeric, milk (or liquid of choice), and honey. It’s almost like a creamy turmeric tea. People are gaga for turmeric right now. It’s detoxifying properties are all the rage. Me? 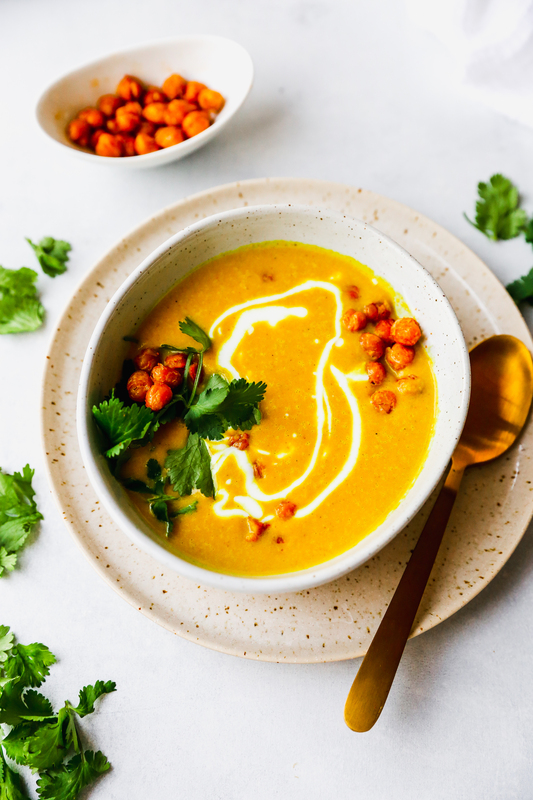 I just happen to think it tastes good, and this soup is no exception! I’ll take the health benefits, too, but really…my focus is that food tastes good first and foremost. 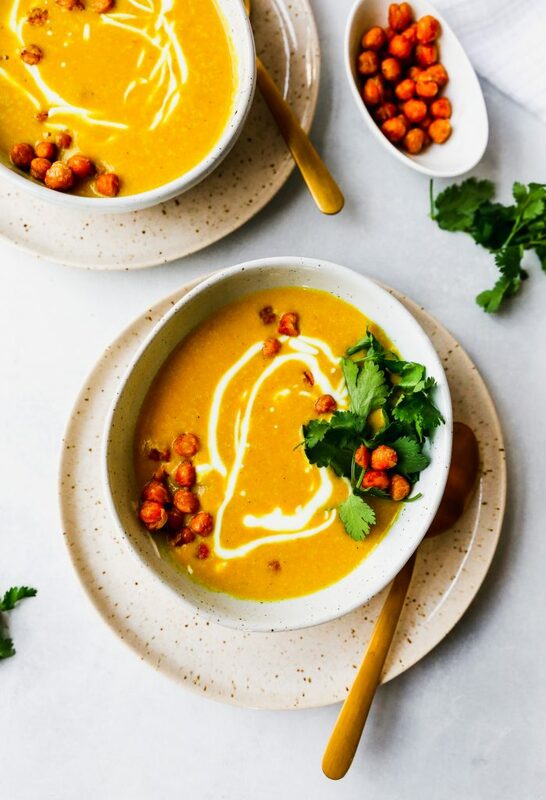 Let’s talk about these chickpeas on top. So, here’s the thing: the chickpea is my least favorite legume. I like them creamed up in hummus and that’s about it. Their texture and flavor do nothing for me. I’d much rather eat a pile of cannellini or pinto beans. UNTIL! I started crisping chickpeas in the oven. OMG. They’re like little potato chips! OK, so maybe not like a true potato chip (because I couldn’t live with myself if I told you chickpeas could truly replace chips, hah), but they DO turn into addictive little crunchy morsels that are perfect for snacking on. Or for topping your soups and salads! For this batch, I tossed a can of drained and mostly dry (which is key to getting them crispy) chickpeas with a drizzle of oil, a sprinkle of salt, and some spices. I put ’em in a hot oven for 20 minutes or so, shaking the pan once or twice, and then had the most delicious little topping for my soup. They add some additional oomph to the soup, both in texture but in flavor as well! 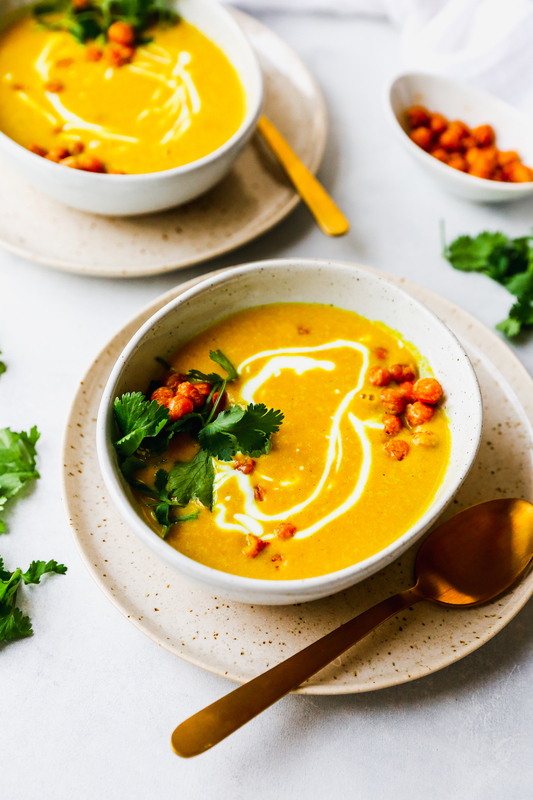 Whether you’re into this soup for the flavor, or you’re more interested in the healthy side of things, I think you’ll be really happy here. It satisfies all needs! Speaking of, I NEED to make another batch of this stat. Heat the oil in a large pot or Dutch oven over medium heat. Add the onion, garlic, and ginger and cook for about 5 minutes, stirring frequently so nothing burns. Add the turmeric and cumin to the pot and stir to evenly coat. Cook for 2 minutes to allow the spices to bloom and toast up a bit. Add the flour and cook for another minute. While stirring constantly, slowly whisk the stock into the pot. Bring the stock to a simmer, stirring frequently. Add in the cauliflower and cook for 10-15 minutes, or until the cauliflower is very tender and falling apart. 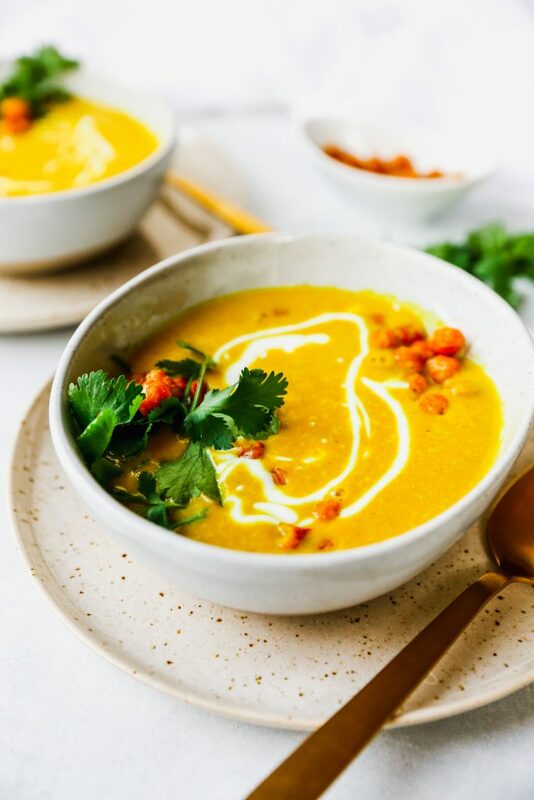 Remove the pot from the heat and carefully, working in batches, transfer the soup to a blender and blend until smooth (alternatively, you can blend right in the pot using an immersion blender). Return the soup to the pot and return to medium-low heat. Stir in most of the coconut milk (save the rest for drizzling over top when it’s time to serve! ), rice vinegar, and maple syrup. Season, to taste, with salt and pepper. Spread the chickpeas out on a clean kitchen towel and gently rub them to dry as much of the moisture off as possible. If some of the chickpea skins start to come off, that is OK. Transfer the chickpeas to the baking sheet and drizzle evenly with the oil. Season with the salt and spices. Using clean hands, toss to evenly coat/combine. Bake the chickpeas for 40-45 minutes, shaking the pan every 10-15 minutes, until they start to feel crisp and dry. Remove from the oven and allow to cool completely (they will continue to crisp as they cool). 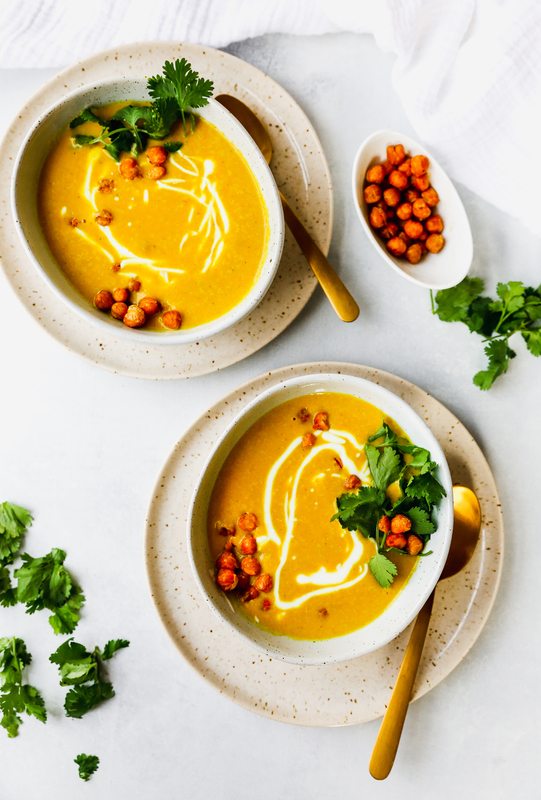 Garnish the soup with the chickpeas and a drizzle of the reserved coconut milk and a sprinkling of fresh herbs. Do you think this would work with frozen cauliflower?